BANGI, 7 Sept 2012 – There were mixed emotions for some new students who had registered for their first semester of the current 2012-2013 academic session at the National University of Malaysia (UKM) Bangi earlier in the week. Some were a bit apprehensive about separating from their family and loved ones but were excited about starting a new phase in their lives. For identical twins Kerk Yih Jen and Kerk Yih Chyi, aged 19, going to university meant not only separating from their family but also from each other. 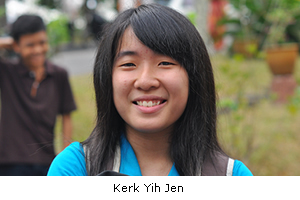 Yih Jen had registered at Kolej Ibrahim Yaakub as she had accepted the offer of a Bachelor’s Degree course in Business Administration. But her twin Yih Chyi won’t be at UKM for her studies as she had registered to be in Universiti Putera Malaysia (UPM) to pursue Economics. Daughters of a mechanic from Batu Pahat, Johor, they came very early with their parents to wait for the registration desks to open. Since birth they had rarely been apart for long. Even in school, they were usually in the same class and did most extra-curricular activities together. Yih Jen said their parents were initially worried about the situation but they understood that eventually both of them would be leading separate lives anyway. She said she and her elder twin had applied to pursue Accountancy at Universiti Malaya (UM) as first choice as they both wanted to be Chartered Accountants. However, they accepted the offers after some thought. As for Normaliza Mat Isa, also 19, from Kulim, Kedah, entering university would be a life-long fulfillment. 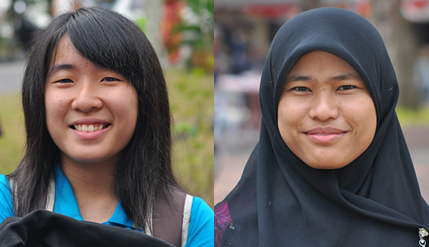 Normaliza got her wish to study Law at UKM, where she will be boarding at the Aminuddin Baki College. Normaliza, her mother and elder brother drove down the day before in a borrowed car to be in time for the registration. She said life had been hard, with her single mother Normah Yahaya supporting the family through petty trading. However they were overjoyed when Nomaliza was accepted to study at UKM and the family gave whatever support they could muster. 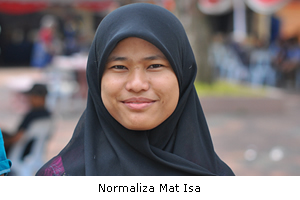 After making sure that Normaliza had settled down, her mother and brother returned to Kulim that very night.